Built to work the way you do! HotlineX supports multiple data sources offering everything from real-time to delayed to end of day. 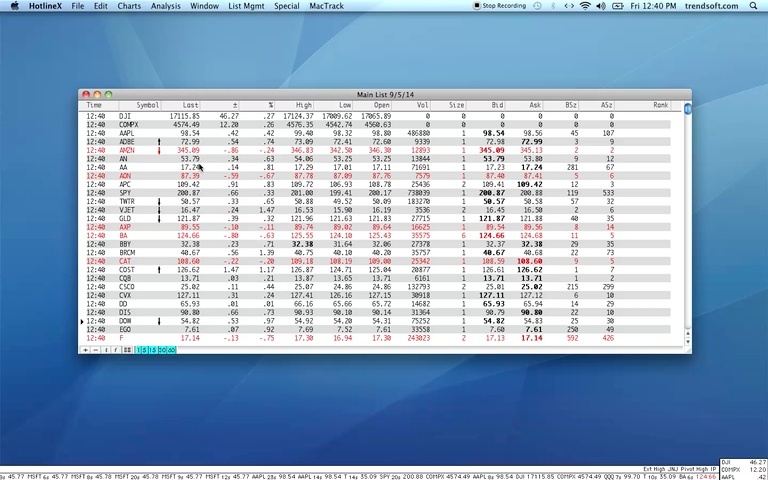 Using MacTrack, our source of live, streaming data, our adjustable quote monitor can display...Time of sale, automatically adjusted to your time zone. Last sale, net change and percentage net change from the previous close, intraday high, low, open and volume. Size of last trade, bid, ask, bid size and ask size are also provided. All price data can be displayed in fractions or decimal. The delta on the left side of the monitor points to the last quote received. Securities that are trading down for the day are displayed in red while fields that match the last sale price are in bold. The directional arrow (right of symbol) indicates whether the last tick was up, down or sideways (no arrow). Drag and drop rows and columns within the quote monitor to reflect your personal needs. The rank column can be used to display a variety of useful information including: your alert levels, EPS, P/E ratio, 12 month highs, lows or range, your entry price, percentage net change, dividends and more! There are over 25 ways to rapidly sort and rank your entire list of symbols. 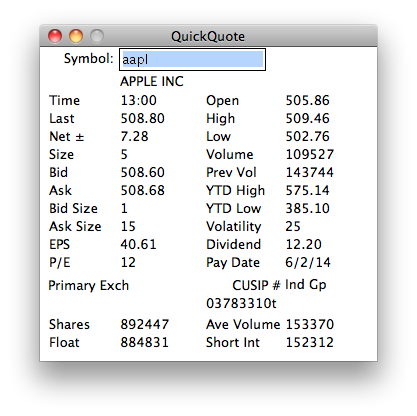 Our QuickQuote feature instantly displays detailed quotes on any symbol.